To make your wedding more than perfect, you can hire a cover band. Booking a band is an excellent choice for a fantastic party. Entertainment company Evenses is a specialist in band booking. Check here a selection of the best cover bands in the UK. 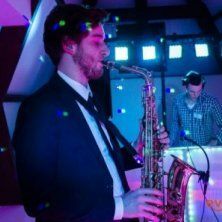 Give your wedding party a real party feeling with some of the UK’s best musicians and vocalists. The DJ Collective Band exists of UK’s best vocalists, a DJ, a saxophonist, percussionist, male and female vocalists and a rapper. It’s the perfect mix of modern pop and party music. The DJ Collective Band plays golden oldies, today’s songs and remixes. This party band is the most unique twist on your wedding. Cover band The Waves offers a big show playlist. During the show the band plays hits from the 50’s and 60’s as well as modern pop and rock. Pop, soul, rock, disco, Indie and rock ‘n’ roll: The Heat Waves are playing everyone’s favourite music. Looking for an experienced band with great vocals? The Jungles is the wedding band for you. This electric and acoustic band exists of 3 professional musicians. The crew members have an experience for more than 14 years The Jungles band has an exceptional repertoire, from country to soul, funk, blouse, pop and rock ‘n’ roll.